A State Farm in the Vidette. Talk is heating up about the future of downtown Normal. In addition to serious discussion about a 150-room, $33 million hotel across the street from Watterson Towers — a project that eventually became the Marriott Hotel — the Student Government Association met with town of Normal leaders to discuss their visions for downtown. National chains like Old Navy, Starbucks and Banana Republic are mentioned in these discussions, but town officials say any talk of their moving into downtown is premature. But grocery and drug stores are on the way, they say. Indeed, today’s Uptown Normal has a CVS location and could soon get a grocery store too. Today’s Daily Vidette editorial raises concerns about the increased cost of student Compucards, a computer access registration tool. For the fall 1992 semester, the cost of the Compucard was raised from $30 to $45, irking some students. The Vidette editorial says it’s “almost impossible” to be exempt from the fee because students must prove ownership of a computer and bring it in to be checked for viruses. “The computer labs across campus are a valuable asset for students who do not have access to computers, but a $15 increase is not justified by offering an optional course that is not valued by every student,” the Vidette board writes. 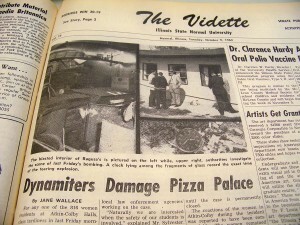 Fifty years ago, the front page of The Vidette. Talk about a wake-up call. 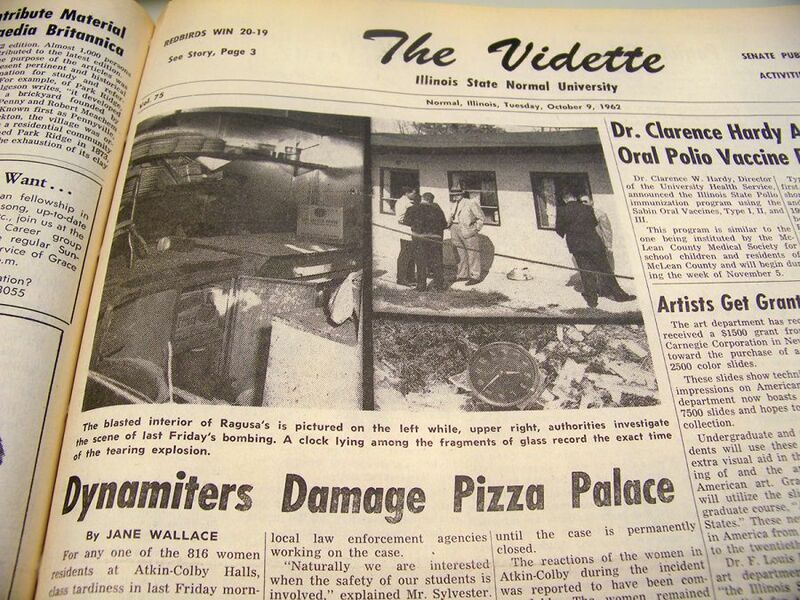 Four or five sticks of dynamite explode just before 5 a.m. on the roof of Ragusa’s Pizza Palace and Italian Restaurant, causing quite a stir for the 816 female residents of nearby Atkin-Colby halls. The head of campus security, Harold Sylvester, is working with state, county, and local law enforcement on the case, since it happened on a property adjacent to the University. “The cooperation given us by the students was wonderful,” Sylvester said. “We appreciate it.” Those on the west end of Atkin Hall are questioned as potential witnesses, since they were closest to the explosion.